ASK QUESTIONS BEFORE YOU ORDER, NO REFUND WILL BE GIVEN ONCE YOU ORDER. This order is for 3 towels SPECIFY COLORS from the drop-down list. These towels are embroidered for Clergy(Ascension Office & Personal Name). NO CHURCH OR MINISTRY NAME CAN BE INCLUDED, NO EXCEPTIONS, IT WILL BE EXCLUDED. DO NOT PUT MORE THAN ONE ASCENSION OFFICE. Any Personal Name can be placed on the towels when you choose the option of (Personal Name). If you want Pastor, Evangelist, Apostle, Prophet or Teacher as the title on your towels, it is not automatically placed there because you need to request that option once you choose Ascension Office & Name as your choice. If you just want the personal name you need to choose that option. 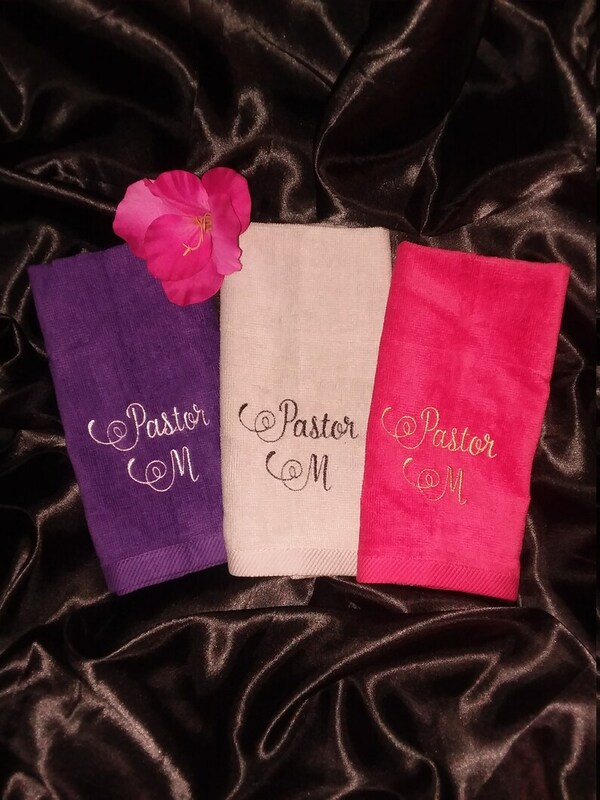 IF YOU WOULD LIKE YOUR CHURCH OR MINISTRY NAME ALSO ADDED TO YOUR TOWELS, IT IS AN ADDITIONAL CHARGE PER TOWEL OF $6. IF YOU TRY TO BE SLICK PUTTING IT IN WITH YOUR REGULAR ORDER, IT WILL BE EXCLUDED, NO EXCEPTIONS. You receive 3 towels in this order. If you want different names make a note of that in the "Personalization" box when you order. Put any additional names and color towels & thread in the question box. anything inbox, the Production Team will not see therefore it WILL NOT be on the towels, no exceptions and asking for a change after a purchase WILL NOT happen. CUSTOM ORDERS ARE NON-REFUNDABLE SO PLEASE BE SURE TO GIVE THE CORRECT INFORMATION. IF YOU HAVE QUESTIONS, ASK BEFORE YOU ORDER. THANK YOU. PLEASE SPECIFY THREAD COLOR of White, Black, Gold, Red, Bronze, Burgundy, Yellow, Lime Green, Teal, Navy, Royal Blue, Green, Pink, Purple, Hot Pink or Brown, Silver. If you do not specify a thread color, one will be chosen for you. will prompt you to make that decision. ***THOSE OF YOU NEEDING TO ORDER FOR CONFERENCES AND REVIVALS, PLEASE PLACE YOUR ORDERS 3-4 WEEKS IN ADVANCE OF YOUR EVENT. ALL RUSH ORDERS/LAST MINUTE ORDERS WILL BE A $100 EXTRA CHARGE FOR LABOR AND OVERNIGHT SHIPPING. NO EXCEPTIONS. ***IF YOU CHOOSE 1ST CLASS SHIPPING OR FREE SHIPPING AND WANT YOUR ORDER INSURED, PURCHASE THE INSURANCE LISTING ALSO. 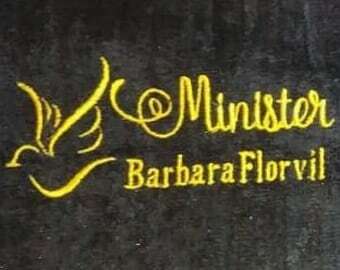 This customer is upset because she did not read the description first and she automatically assumed that because the sample photo shows towels for a Pastor, that the title of "Pastor" was automatically embroidered onto the towels, but had she read the description in its entirety what she would've found is that's not the case at all. She was upset and wanted our company to resend her another set, but again as I've already stated she did not read the description nor our policy which she made mention of and confirmed in an email. I did however let her know that if she would like to place another order that would be fine and that we would get that pkg in the mail to her as soon as it was processed and we could even ship that new pkg to her via Overnight Mail in time for her event. Love it....This company shipped on time no issues at all. I did not know that I wouldn't be receiving the darker grey towel color that is pictured in the sample pictures, and there was no information in the listing stating that I would be receiving a much lighter grey towel. The drop down menu simply says silver grey. Therefore, I picked white thread for the embroidery. So of course you can barely see the white embroidery on a light grey towel! Upon contacting them I was told "so the thread color you picked is too light and you would like to know if it can be changed. Unfortunately that would not be possible to do, but you can purchase another set of towels with a different thread color." All orders are to be paid for immediately, especially custom. No work will begin until payment is made. NO EXCEPTIONS. All Orders are final. No refunds unless items have been grossly misrepresented. You are not eligible for a refund just because you decide to change your mind after you've received the item. You are not eligible for an exchange because you decide once your receive the item that the color is wrong. The color you choose is the color you will receive, nothing less. All Sales are final. Preferred Shipping Method is Priority so that you can get faster and your item is automatically insured. If you choose First Class and your shipment is lost in route, there is nothing we can do to prove that someone else received it. If you live in an apartment, be sure to let your property manager know that you are expecting a package and to please contact you once it reaches the location. We are not responsible for misread addresses, so if for instance you've typed it in wrong. Etsy will print out your shipping label exactly how you typed it in. No order expected in time for Christmas will be shipped after that date in expectation of receipt for that date. Shipments for Easter ends April 1st. No orders expected in time for Easter will be shipped after that date in expectation of receipt for that date. Shipments for Halloween ends October 14th. No orders expected in time for Halloween will be shipped after that date in expectation of receipt for that date. No orders expected in time for July 4th will be shipped after that date in expectation of receipt for that date. No order expected in time for Mother's Day will be shipped after that date in expection of receipt for that date. No orders expected in time for Father's Day will be shipped after that date in expectation of receipt for that date. These dates are set in place so as to ensure you receive your orders on time for the expected holiday. Custom orders can be placed and no refunds are given for custom orders. No refunds are given because you decided after receiving that you change your mind. No refunds are given because your order is lost in transit or that your order is late due to circumstances beyond our control. When you place your order and submit it as First Class Shipping, you may also purchase insurance for that same item, under the listing of "Shipping Insurance"
We allow you to fully customize your item. Please be sure that what you are requesting is really what you want. be sure you have chosen the correct embroidery thread color and that all names are spelled correctly. If what you want cannot be easily found, we will get as close to it as possible and make you aware immediately. If you do not choose a embroidery color, one will be chosen for you, this will be one of our House Colors. Upon looking around and making your choice(s), go to the drop-down menu and choose one of your choice colors if you are purchasing towels and place the other 2 colors into the "Personalization Box" then complete your order. Please keep in mind if you do not state an embroidery thread color our team will make a professional determination that is appropriate for that particular color towel, without notice. If you are purchasing another item such as lap hankies, you would basically do it the same way, except you'll need to also choose your lace color as well as your hankie color and embroidery thread color. Yes I do accept custom orders, but you only have to request one if you don't see the merchandise you're looking for or if you're ordering more than what I have listed. Where do I place my personalized information? Place all of your details with the "Personalization Box" within your order area. All of our merchandise is custom handmade by order so I do not accept cancellations nor do I give refunds! Because all of our merchandise is customized, we don't allow for refunds, however if the error was on the part of the seller, a proper refund will be discussed with you and decided upon at such time it is brought to our attention. Please keep in mind that if a refund is given, it will be processed immediately after conversing with the buyer and depending on how your financial institution processes refunds, it may take 3-5 business days or longer for that particular refund to actually post to your account, so please be patient. Thank you.